‘Beware! 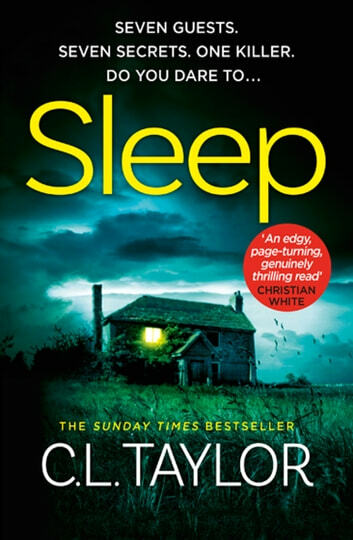 Sleep does not do what it says on the tin: I was awake until the small hours under its dark and twisty spell.’ FIONA BARTON ‘Extremely creepy, atmospheric and twisty.’ CLAIRE DOUGLAS ’Another cracking psychological thriller from C.L. Taylor. Sleep will keep you up all night.’ MARK EDWARDS All Anna wants is to be able to sleep. But crushing insomnia, terrifying night terrors and memories of that terrible night are making it impossible. If only she didn’t feel so guilty… To escape her past, Anna takes a job at a hotel on the remote Scottish island of Rum, but when seven guests join her, what started as a retreat from the world turns into a deadly nightmare. Each of the guests have a secret, but one of them is lying – about who they are and why they're on the island. There's a murderer staying in the Bay View hotel. And they've set their sights on Anna. Seven strangers. Seven secrets. One deadly lie. Someone’s going to sleep and never wake up… The million-copy bestseller is back in her darkest, twistiest book to date. Read it if you dare!